The TwistedWave reference manual is available both in a browsable format, from the Help menu, and as a printable PDF here. What makes TwistedWave unique is its ability to deal with very large files. You don’t have to wait until TwistedWave has finished loading a file or applying an effect before you can start playing the result, or applying another effect. You can read more about this in section 2.3. The first thing you will do with TwistedWave will be to load an existing audio file, or create an empty document. These tasks are described in the two following sections. Create a new document by selecting File / New from the main menu, and you will be asked for the bit depth, sample rate and number of channels for the new document. The bit depth indicates the resolution at which the file will be saved. 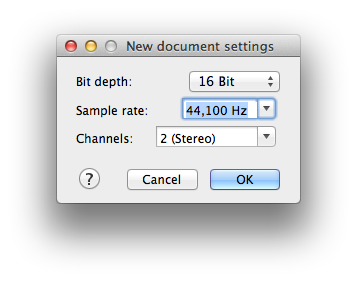 With a higher bit depth, the sound quality will be better, but the files will be larger. For good results, a value of at least 16 bits is recommended. Note that you can still change your mind, and select a different bit depth when you save the file. If you save in a compressed file format, such as aac or mp3, the bit depth will not have any influence on the resulting file. For the sample rate, however, it is important to select the correct value from the beginning. It is possible to change the sampling rate afterward, but the conversion is never perfect, and will result in a slight reduction of the audio quality. The third parameter is the number of channels. Select 1 for mono files, 2 for stereo files, or any other number you may need. More commonly, instead of starting with an empty document, you will want to open an already existing file, and start working on it. TwistedWave can handle many different file formats, and opening an audio file works similarly to any other application, by selecting File / Open... in the main menu. TwistedWave also supports many movie file formats, and selecting one will extract its sound track. When you open a very large file in TwistedWave, it can take a while for it to load completely. However, you can still immediately start playing the file, adding effects, copying and pasting parts of it or do whatever while the file is still being loaded! It is only when you want to save the resulting file that you will have to wait for all the pending tasks to be completed. When a task has not finished processing, the part of the waveform that is not up to date appears in a lighter color, and a progress bar at the bottom of the window indicates the effect being applied, and the amount done. As it is important to be able to quickly navigate in the sound file to find the portions you want to listen to, or edit, TwistedWave offers a number of ways to manipulate the waveform. Both zooming and panning are fast and easy. Here are the different ways to perform these. This is the simplest and most obvious way to zoom. Two buttons in the toolbar allow you to easily zoom the waveform in and out. 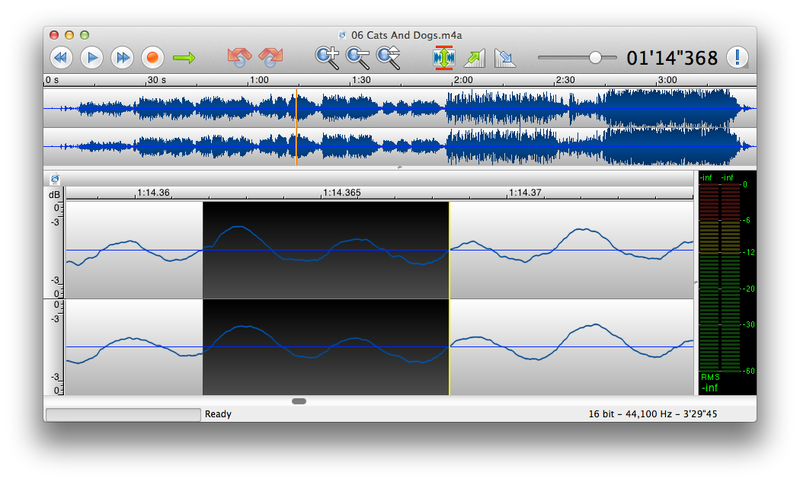 One easy way to zoom in the waveform is to use the mouse wheel. You can zoom in and out by scrolling up or down. By default, when zooming in and out, TwistedWave makes sure the cursor remains in the center of the window. An option in the preferences window (section 16.2.1) can make this zoom be centered on the mouse pointer instead. When this option is enabled, you can move the mouse pointer left or right to adjust the point where you want to go as you are zooming in. Another easy and very fast way to zoom in the waveform is to press the command key, and drag the mouse vertically. Move the mouse down do zoom in, and up to zoom out. You can also move the mouse horizontally to indicate where you want to zoom in. This is a very powerful way to navigate in the waveform, because it allows you to zoom and scroll at the same time. In a single drag, you can zoom out, move the mouse over another location in the file, and zoom back in. With the Vertical Zoom toolbar icon. By clicking and dragging on this icon, you can adjust the vertical zoom. A single click will restore the zoom to its original value. By click and dragging on the vertical ruler at the left of the waveform. This works the same as the toolbar icon. A double click will restore the zoom to its original value. By using the scroll wheel with the command modifier key. If you have a mighty mouse, or another kind of mouse that offers a horizontal scrolling mechanism, you can use it to scroll the waveform in TwistedWave. With a regular scroll wheel, you can also scroll horizontally by pressing the shift modifier key. 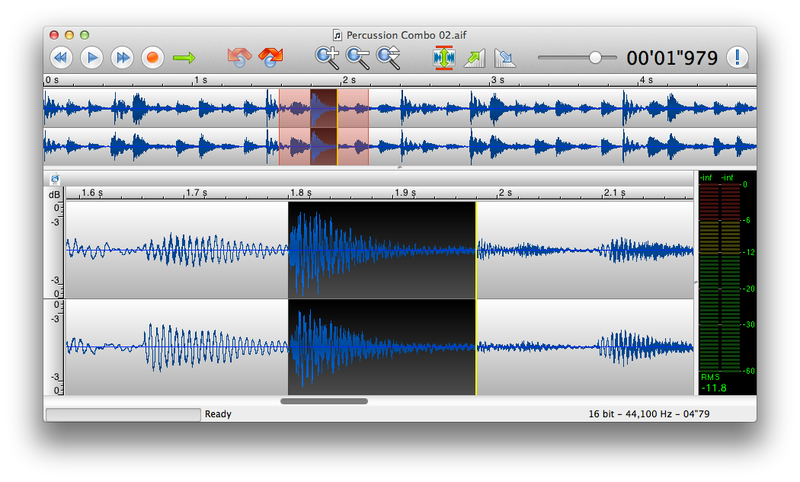 Another way to scroll the waveform is to drag it with the mouse while pressing the control key. Additionally, when you are selecting, TwistedWave will automatically scroll the waveform when the mouse reaches the edges of the document window. As the pattern described above to move in the waveform (zoom out, change position, zoom in) turns out to be quite useful, there is a keyboard shortcut just for it. Press Shift-Z, and the wave will zoom out. When you release the Z key, it zooms back in at the same level you were before. When you keep the Z pressed, a window appears, showing you where you will be when you zoom back in. By moving the mouse horizontally, you can move the window to the location you want to be. Note also that when you are zoomed in, you can continue zooming or panning with the scroll wheel, the scrollbar, or by manipulating the red window in the overview, control dragging or whatever. When you release the Z, the view will always revert to the position you were before you started zooming. This can be useful if you want to see or select something at another location with the ability to return back where you were just by releasing the Z key. The overview is the area above the main waveform display that shows the whole file, with a red window indicating the portion visible in the main display. This red window can also be manipulated in order to change the visible portion of the sound file. You can drag it to another position, or reshape it by dragging one of its edges in order to see a smaller or larger area. If you press the option key while dragging the window, you will be able to make it shrink or grow, effectively zooming in or out of the waveform. By default, all the effects available will be applied to the whole sound file. Often, you want an effect to be applied to a small portion of it. You can do this by selecting the area you want the effect to work on before applying the filter. In order to select a part of the sound file, just click and drag the mouse over the area you want to select. In order to get more precision on the area you are selecting you can temporarily zoom at the places where you want to start and stop selecting. This process is described in more detail in section 3.4. It is possible to adjust the current selection by dragging one of its edges. This is done by pressing shift when clicking on the waveform. It is often necessary to select a whole channel. TwistedWave provides a convenient way to do this by double-clicking on a channel. All the data on that channel will be selected from the first to the last frame. After having double clicked, you can keep the mouse button down, and drag the mouse pointer over adjacent channels to select them as well. By using the option or shift-option key combinations while double clicking, you can add or remove whole channels from the current selection. By triple clicking, you can also select all the channels at once. This is equivalent to using the Select / All menu item. A powerful way to edit the selection is with the selection editor. It can be opened from the menu Select / Edit Selection…, or simply by clicking on the selection length in the toolbar (The selection length is not present in the default toolbar. You can add it by right-clicking on the toolbar, and selecting Customize Toolbar….). 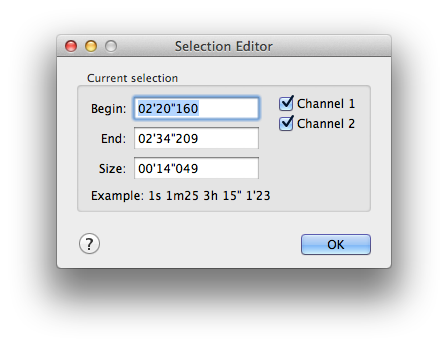 The selection editor allows you to enter numerical values for the begin, end and size of the selection. When you enter a time in any of these fields, TwistedWave understands many formats. Simply entering a numerical value such as 5 corresponds to a number of seconds. You can also enter 1m25 to indicate one minute and 25 seconds. 3h means 3 hours, 15" is 15 seconds, and 1’23 is one minute and 23 seconds. On the right hand side of the selection editor, a number of check-boxes are used to indicate which channels have to be selected. This can be used to select only the left or right channel in a stereo file, for instance. Exactly as you can enter the numerical values for the selection, the cursor editor allows you to enter the time you want to move the cursor to. The cursor editor is opened from the menu Select / Edit Cursor…, or by clicking on the cursor position in the toolbar. Usually, a selection is just an area contained between two samples. With TwistedWave, you can have more complex selections that are composed of several disjoint areas. Such selections can be useful when you want to apply an effect at different places in the file. Instead of selecting an area, applying the effect, selecting another area, and reapplying the effect, you can select all the areas at once, and then preview the effect on them all, and apply it. Two key combinations allow you to create complex selections. The first is by using the alt/option key. When it is pressed, the selections you make by dragging the mouse are added to the current selection. You can also remove an area from the selection by using both the shift and alt keys. As with simple selections, it is still possible to adjust the edges of complex selections with the shift key. When the Auto Extend to Crossing option from the Select menu is enabled, the selection is automatically extended by a few samples to the next zero crossings of the wave at its edges. This is done in order to avoid discontinuities when the sample is cut and pasted somewhere else. A discontinuity in the sound wave would result in a click when played, and should be avoided. When you move the insertion cursor, it is also automatically moved next to the closest zero crossing. That way, when you paste something at that position, this will not introduce a discontinuity. The selection was automatically adjusted to start and end at a position where the wave crosses the zero axis. It is important to note that if TwistedWave has not finished loading the file you are working on, or if it is currently applying an effect, the Auto Extend to Crossing function will not work. The reason is that because in such a case, TwistedWave cannot accurately determine the position of the zero crossings. It is therefore not possible to adjust the selection accordingly. Imagine you have recorded a long file, and you would like to cut the silences, make them shorter, or split the different parts separated by silences. This can be a very time consuming task, and should certainly be automated. From the main menu, click Select / Detect Silences..., and a silence detector will come to the rescue. When the silence detector is open, it will automatically analyze the audio file, and detect the silences. In order to preview the silences detected, they will automatically be selected. Alternatively, you can choose to select the sounds instead of the silences. That way, you can start playing the audio, and will hear all the regions that do not contain silences. Select Silences. This option will select the parts of the audio containing silence. Select Sounds. This is the opposite of the previous option, and only the areas not containing silence will be selected. Place Markers. Markers will be automatically placed at the beginning and end of each detected silence. Delete Silences. All the silences will be deleted. Delete Silences and Mark. All the silences will be deleted, and some markers will be placed where the cuts were made. If the simple silence detector fails to detect the silences contained in the audio file, you can switch to the "Expert mode" where a number of parameters allow you to fine-tune the silence detection. Threshold. 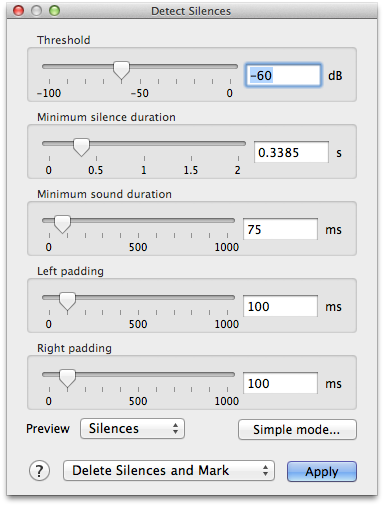 This parameter specifies the sound level in dB below which a sound is considered as silence. 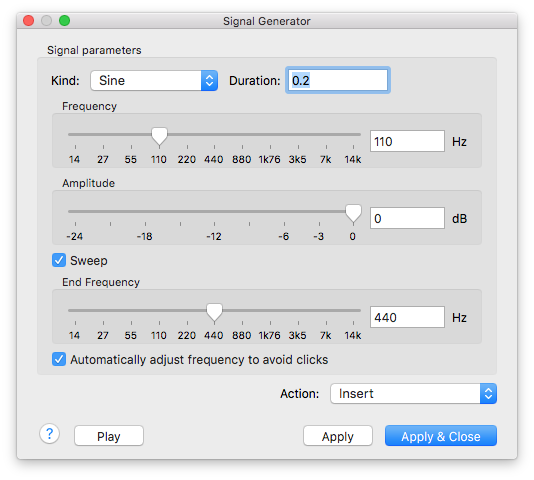 Note that when you open the silence detector, the sound file is analyzed, and this parameter is automatically set to a value that should be fine. You should only have to change this parameter in some cases where the distinction between sound and silence is less obvious. Minimum silence duration. This parameter specifies the minimum duration below which a silence is not considered. This can be useful when detecting silences from a file containing spoken text, and a small pause between two words should not be considered as silence. Minimum sound duration. This parameter specifies the minimum duration below which a sound is not considered as such, and will be treated as a silence. When a short noise is present during a silence, it can be desirable to still consider the silence as a whole, and ignore the sounds up to a given length. Left and right padding. When you want to cut the silences from a sound file, it may be necessary to keep around a fraction of a second of audio before and after each sound. If the sound fades out at the end, for instance, it may be necessary to keep it a bit longer even after it drops below the silence threshold. A common use for silence detection is splitting an audio file containing several sounds into several audio files. In order to do this, select the option Delete Silences and Mark when detecting silences. You should then rename the markers to give them the names you would like to give to your files. You can easily do that with the markers window (see section 11.3). And you can then export all the parts separated by markers from the main menu, Markers / Split by Markers (see section 11.4). One of the most difficult tasks when editing an audio document is to properly select the area you want to edit. The capture here shows TwistedWave with a file loaded, containing a percussion loop. The individual shots are clearly visible, but accurately selecting one of them requires quite some dexterity. This is where the transient detection in TwistedWave comes handy. This allows TwistedWave to automatically detect the individual shots in the file. The operation Select / Move Cursor to Transient, available with the Tab key by default, moves the cursor to the next transient in the file, and can be used to easily move to the start of every individual shots in the file. 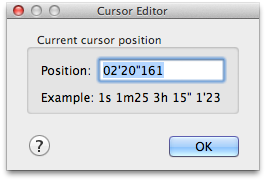 You can then Shift-Tab to select the area between the cursor position and the next transient. This is how we could easily select a single shot, as shown in the capture here. The transients in the example shown here are clearly identifiable. Often, however, there may be a lot of background noise, and the transients may not be as strong. If TwistedWave fails to detect the transients, you can adjust the detection threshold from the preferences window (see section 16.2.4). Just as in a text editor, once you have selected an area of the sound file, you can copy the selection, and paste it somewhere else with the usual ⌘X, ⌘C and ⌘V shortcuts. In addition to the simple paste that inserts the contents of the clipboard at the location of the cursor, you can paste over the existing data. When you Shift-⌘V, the contents of the clipboard will be mixed in, without altering the length of the file (Unless you are at the end of the file.). In addition to the simple copy and pasting commands described above, TwistedWave provides a special pasting command whose behavior can be customized in many ways. This command is available in the menu Edit / Special Paste, or with ⌘Y by default, and can be customized with Edit / Special Paste Options…. The pop-up button at the top of the special pasting options selects the operation that is performed when the Special Pasting command is invoked. Insert will just insert the contents of the clipboard at the position of the cursor. This is also what does the default paste, available on ⌘V. Mix will not make make the document any longer, but will mix the clipboard with the contents of the document starting from the position of the cursor. This behavior is similar to the paste over, available on Shift-⌘V. Replace will replace the selection with the contents of clipboard. This is similar to Mix, except that only the selected area will be affected. The clipboard will be truncated to match the length of the selection. If the selection is longer than the clipboard, the extra sound in the selected area remains unaffected. 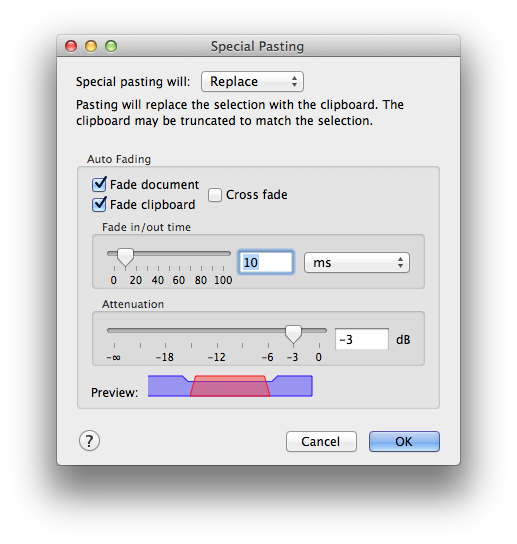 What makes the special paste special is its ability to automatically fade in and out the contents of the clipboard, and the document in which it is pasted. When copying and pasting, by default, TwistedWave will make sure that the edges of the clipboard and the document at the insertion point will fall on a sample value of zero. In most cases, this will prevent a click when pasting. However, the transition to the clipboard can still seem too brutal, and the automatic fading in and out can help a lot making things smoother. With the options to fade or not the document and the clipboard, a large number of effects can be achieved. In order to immediately see how the fades are applied, a preview representing the document and the content being pasted is shown at the bottom of this options panel. The blue part represents the document, the red part is the contents of the clipboard, and the slopes show where the fades take place. Deleting a region from the middle of a file will produce a noticeable cut in the resulting file. This is often not desirable, and a common solution to such a problem is to apply a crossfade. In order to apply a crossfade in TwistedWave, simply select the region you want to delete, and select Edit/Delete and Crossfade... from the menu, or use the ⌘-Backspace shortcut. A window will pop-up asking you for the duration of the crossfade, and will then proceed to mix the audio before and after the region deleted in order to make the transition smoother. In addition to the crossfade duration, a pop-up button allows you to use a fade out followed by a fade in instead of the crossfade. 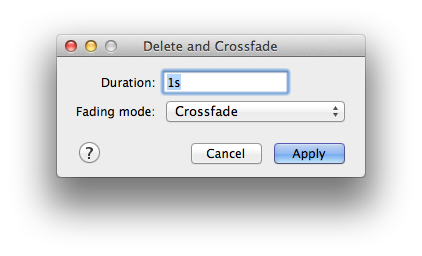 A third option, Crossfade Centered, differs from the Crossfade by the way TwistedWave applies the crossfade. With the first Crossfade option, the selected area is completely removed, and a piece of sound corresponding to the crossfade duration is taken before the selection, another piece is taken after the selection, and these two are then mixed together to apply the crossfade. With the Crossfade Centered option, the two pieces of sound are not entirely outside the selection, but centered on the beginning and end of the selection. The benefit is that if you select 10 seconds of sound, for instance, and apply such a crossfade, the total length of the file will be reduced by 10 seconds, and the reduction does not depend on the duration of the fade. This can be very important when editing music, for instance. If you select an area between two beats, you can apply a crossfade without breaking the rhythm. After a crossfade is applied, you can still manipulate it, change its duration, in and out points. See section 5.2. When working an a long sound file, it is often necessary to take a few bits out of it, and use them later on to build a new document. This can be done by copying each part of the file you are interested in, and pasting it in a new document, but this can be tedious, and you will end with many document windows obscuring your screen. As a solution to this problem, TwistedWave offers a clip list. You open it from the menu View / Show Clip List . Now, when you zip through the audio and have selected an interesting bit, instead of copying it to the clipboard, create a new clip from it. Simply press the New Clip… button, use the corresponding menu item, or press its key shortcut, simply N. You are then asked to enter a name for the new clip. Once you have filled the clip list, you can play, paste or delete them from the list with the corresponding buttons that appear in front of their names. When the Paste over option is checked, the clip is not inserted in the audio file, but mixed with the already existing data, without altering the length of the file. 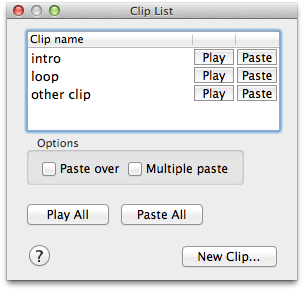 When the Multiple paste option is checked, when you press the paste button, you will be asked how many times the clip should be pasted. This can be useful when you want to paste a clip many times without having to repeat clicking on the paste button. In order to cut or to apply a crossfade to a part of the sound file, you first have to carefully adjust the selection, and then cut or crossfade (see section 4.11 for applying crossfades). If the result doesn’t sound good, you can undo, tweak the selection a bit, and try again. TwistedWave offers a better alternative. You can manipulate the cut or crossfades after it has been applied, and preview it without having to undo or redo anything. 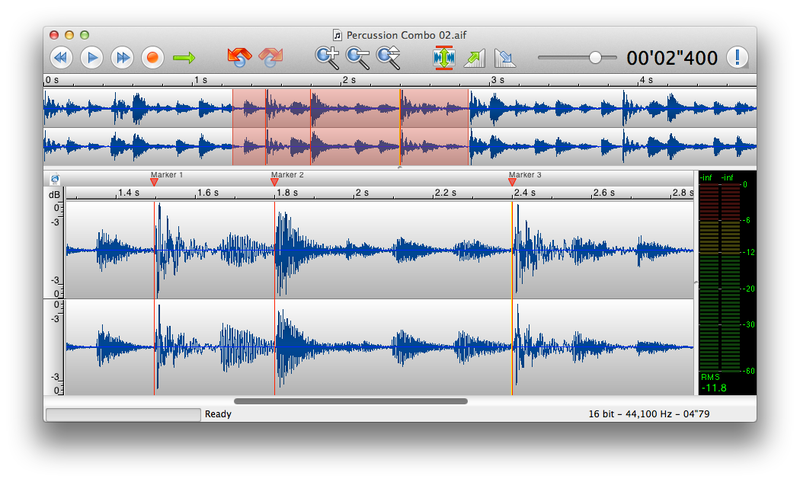 Note that cuts and crossfades can only be edited when they are the last operation performed on a sound file. If you perform another operation, the changes you would have made to the cut or crossfade are committed, and you cannot edit them without having to undo and redo them, in the old way. These two arrows are in fact two handles, and you can grab and drag them to move the audio in or out of the cut. 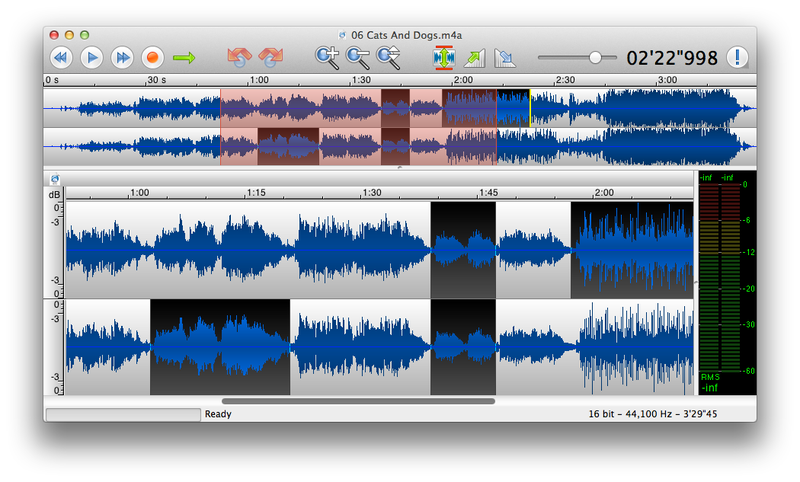 The capture below shows the waveform just after having applied a crossfade. Just as when editing cuts, two arrows appear, which you can grab and drag to adjust the position where the crossfade starts and ends. You can also grab one of the two vertical bars, and drag it to adjust the duration of the crossfade. Note that depending on the kind of crossfade you have selected, adjusting the crossfade duration can affect the total length of the file or not. See section 4.11 for more information. When editing an audio file, in order to find out what parts of the file to select, cut, or apply effects to, it is important to know to what parts of the waveform correspond what sounds. When you play the file once, you get a rough idea of what sound corresponds to a given shape in the waveform. While TwistedWave is playing, it is possible to click in the waveform to move the playhead, or select a specific area you are interested in. You may find that simply playing a selection is no enough to make accurate selections, and this is where scrubbing comes to the rescue. Scrubbing gives you more control on the position of the playhead, and allows you to listen to very specific parts of the audio and get a clear idea of where specific sounds are located in the waveform. Scrubbing is performed by clicking and dragging the mouse in the rulers, above the main wave and the overview windows. Depending on your needs, three scrubbing modes can be selected from the preferences window. Repeat. In this mode, a small area around the mouse pointer is repeated continuously. The audio is played at the nominal speed, and sounds natural. Velocity. This mode allows you to control the speed at which the playhead moves in the waveform. This mode allows you to play the audio slower or faster than the nominal speed, but this also affects the pitch of the sound. This mode can be very effective when detecting clicks in the audio. Position. This mode is similar to the velocity mode, except that you have a direct control on the playhead position rather than its velocity. This makes it easier to play a very specific area. This section describes a few effects provided by TwistedWave. The most interesting effects, however, come from plugins in the Audio Unit or VST format. Using plugins in TwistedWave is described in detail in section 8. The simplest effect you may want to apply on a signal is to adjust its volume. The amplify effect allows you to choose a gain in decibel to apply to the selected area of the sound file. When you record from a microphone, or import a sound sample in another way, it can happen that the sound level was not properly adjusted, and appears very low when played, compared to other sound files. You can use the amplify effect to increase the volume by the desired amount. The normalize effect, however, does this automatically. It scans through the entire region, and finds the area where the sound level is the highest. It can then automatically determine by what amount it is possible to amplify without introducing any clipping. Peak Value. With this setting, TwistedWave look at the sample with the highest peak value, and the sound volume is then adjusted to have the level of this sample match the value specified in the normalization level. With this setting, and a normalization level of 0 dB, for instance, TwistedWave will amplify the sound as much as it is possible without generating any clipping. True Peak Value. This setting is similar to the above, with the difference that the signal is oversampled in order to detect peaks that happen between two samples. This can be useful to make sure the level does not exceed a certain value after the audio has been converted from digital to analog. RMS Value. This setting is different from the two previous in that TwistedWave does not look for the loudest part in the audio, but computes the average energy content of the whole audio. LUFS (BS-1770, R128). This setting is similar to the previous one. The only difference is in the way the average energy content is measured. TwistedWave uses the recommendation ITU-R BS.1770 to compute a value more closely related to the perceived loudness, by attenuating the low and high frequencies before measuring the average energy content. The next two settings, the maximum gain and maximum attenuation, indicate the maximum amount by which TwistedWave can amplify or attenuate the sound volume to match the given normalization level. If these options are not checked, TwistedWave is allowed to adjust the gain as much as is necessary. The last setting, maximum peak value is useful when we are normalizing to a target RMS or LUFS value. In these cases, especially if there is a lot of dynamic range in the audio, it is possible for the normalized sound to exceed the full scale, and clip. When this option is checked, TwistedWave will make sure the maximum peak value does not exceed the specified value, even if that means the loudness does not reach the target value. These effects will continually adjust the sound volume of the selected area. When applying a fade in, the sound volume gradually increases to its original level. A fade out does the opposite, and decreases the volume to zero. To see how you can apply crossfades, see section 4.11. The custom fade is more customizable than a simple fade in or fade out. Instead of gradually fading from 0 to 100%, the attenuation can be specified at the beginning and the end of the selection. The "Loop Crossfade" is a special kind of fading where the end of the sample is crossfaded with the beginning. The resulting sample can be played seamlessly in loop. All the channel manipulation functions are grouped in the Edit menu. 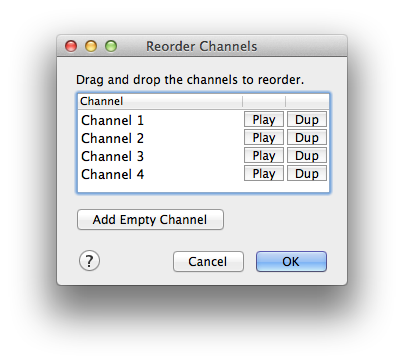 A few basic functions allow you to add or remove channels, and convert the document to mono or stereo. Reorder the channels by drag and dropping them. Remove selected channels by pressing the delete key. Add channels by duplicating already existing ones. The sampling rate is the frequency at which the sound is sampled. On a CD, for instance, the sampling rate is 44 100 Hz. It can be necessary to convert the sampling rate if you have a recording at 48 kHz, and you want to record it on a CD, for example. With a lower sampling rate, the sound data will take less space on the disk, but at the cost of loosing the high frequencies. The highest frequency that can be represented at a given sampling rate is half the value of the sampling rate. On a CD, for example, no sound higher than 22 050 Hz can be represented. 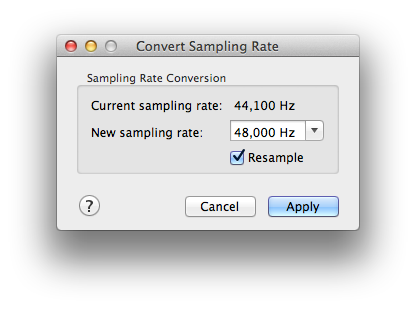 The window that asks you for a new sampling rate offers the option to resample. When it is checked, as it is by default, the wave will be resampled so that it does not sound different (Unless you are converting to a lower sampling rate, in which case you will lose the higher frequencies.). If you uncheck it, TwistedWave will keep the samples untouched, and merely tag the audio as having the new sampling rate. This will result in the sound to be played faster or slower. The file will also sound higher or lower, just as if you were adjusting the speed of a turntable. If you want to change the speed of a file without modifying the pitch, you should use the Change pitch and speed function, described in the next section. This function allows you to change the pitch and speed of a sound file. It can be used to change the speed without affecting the pitch, changing the pitch and keeping the original speed, or any combination of pitch shifting and time stretching. By checking the Lock speed and pitch option, you will get the effect you would have when playing a tape or record at a different speed, where both the speed and pitch are affected at the same time. When the Use ZTX processing engine option is checked, instead of using Apple’s time stretching implementation, TwistedWave uses the ZTX Time Stretch/Pitch Shift technology licensed from Zynaptiq GmbH, http://www.zynaptiq.com/ztx/, (c) Zynaptiq GmbH. ZTX’ pitch shifting is one of the best pitch shifting implementations, and is an excellent replacement for Apple’s one. 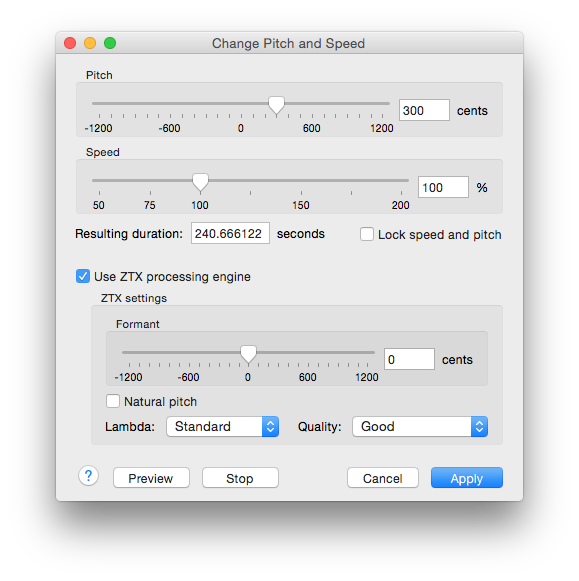 In addition to shifting the pitch of the audio, the ZTX processing engine can also shift the formants. By shifting them with the opposite value of the pitch shift, they will be unaffected by the pitch transformation, and the result will sound more natural. By checking the Natural pitch option, the formant shift will automatically be adjusted to avoid them being pitch shifted. ZTX uses a novel algorithm that can be scaled to provide good time domain localization or good frequency localization, or both. High time localization means that ZTX produces results similar to the time domain pitch-synchronized overlap-add (PSOLA) methods, high frequency localization produces results that are closer to what you get from an improved phase vocoder. This ability is controlled by the “lambda” parameter. As a rule of thumb, a low Lambda value provides good time localization (good for voice and single instrument recordings), while a high lambda value is good for entire mixes. High lambda values take slightly more time to process but are not considerably slower. Preview. 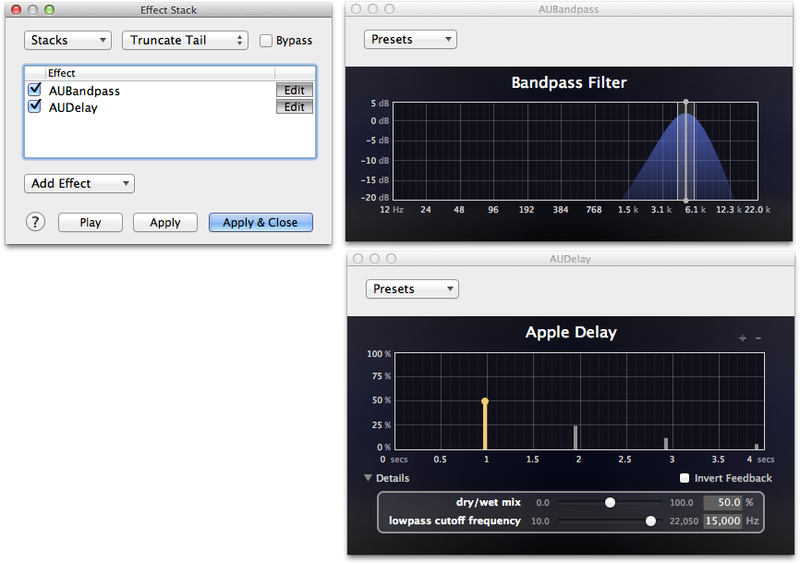 This automatically selects the best time/frequency trade-off for realtime/preview performance. It is the fastest setting but might not provide the best results in all cases. Voice. Selects full time localization. Good setting for single instruments and voice. Duet. Time/frequency localization with emphasis on time localization. If a setting of Voice produces echoes this might be a better choice. Standard. This sets the time/frequency localization halfway between time and frequency domains. It is the best setting for all general purpose signals and should be set as default for non-realtime (non-preview) processing. Transcribe. Special mode for very large stretch ratios (2x to 4x). 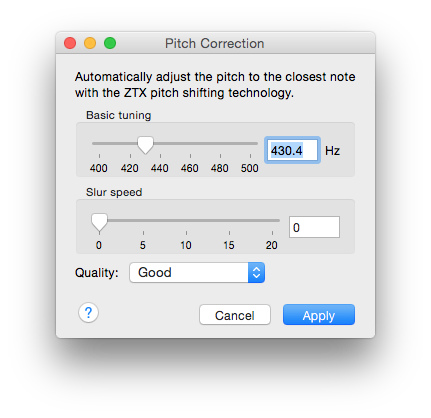 The pitch correction uses the ZTX Time Stretch/Pitch Shift technology to automatically adjust the pitch of the selected audio. It works by detecting the pitch of each note, and adjusting them to the closest note. Basic tuning. This value defines the reference tuning for the pitch correction. Slur speed. Defines the time it takes for the correction to reach the full correction amount. Typically, notes are a bit unstable at the beginning, because the attack phase of a sound has a higher amount of noise, and because singers gradually adjust their tuning after the onset of the note. The slur time makes the pitch correction sound natural because it models this effect. Higher values will yield a slower adaptation time and it will take longer for the correction to produce the corrected pitch.However, longer slur times will also preserve vibrato better. Quality. This setting allows you to choose a compromise between the sound quality and the processing speed. Audio Units is Apple’s audio plugin technology. These plugins produce sound effects that can be applied to the selected parts of your documents. A few Audio Units are provided by Apple and are available on every Macintosh, such as a few filters, equalizer, pitch shifter, reverb and more. Many Audio Units provided by third parties are also available. A comprehensive list is available on macmusic.org. VST (Virtual Studio Technology) is another plugin technology, created by Steinberg. Similarly to Audio Units, VST plugins can provide many effects, and a comprehensive list is also available on macmusic.org. Loading a plugin is as simple as choosing it from the Effects / Audio Units & VST menu. TwistedWave will open a window showing the plugin interface. When you opened an Audio Unit or a VST plugin, it remains active on the current document. That means that when you start the playback, the plugin will be applied to the file in real time. You can even have more than one open at the same time, and they will all process the sound when the document is being played. In some cases, you want an Audio Unit or VST plugin to be applied not just to one document, but to all the documents open in TwistedWave. This can be done with the Global option. When it is checked, the plugin window will remain visible, and the effect will be applied when playing back any document. This can be useful in particular with visualization plugins. A VU meter, for instance, could be useful for all the documents you could be working on. If you want to permanently alter the sound file by processing it with the the Audio Unit or VST plugin, you can press the Apply button, and the plugin will process the selected area of the document, or the whole document if nothing was selected. Note that when the file is saved, the active plugins will not be saved, and won’t affect the file being saved. If you want to save the result of processing the document with a plugin, you should apply it first. Truncate tail. With this option, the plugin will stop processing once it has reached the end of the selection, and the tail will be discarded. Insert tail. The tail will be inserted in the document, at the end of the selection. Merge tail. The tail will be mixed with the contents of the document after the selection. Note that this option will alter a part of the sound that is not selected by mixing the tail of the effect to it. You can press the Save button at the top of the plugin window to save the current preset. You will then be asked to name the new preset. You can access saved presets from the Load Preset pop-up button. Presets are saved as files in a folder corresponding to the current plugin. Selecting Manage Presets… from the menu will open this folder in the Finder. This allows you to rename or delete presets. You can also put them in sub-folders, and they will appear in sub-menus when you open the presets menu. With the effect stacks, TwistedWave provides a convenient way to group plugin together. This makes it easy to save their presets as a whole, reorder the plugins, or apply all of them at once. Select New Effect Stack… from the Effects menu, and TwistedWave will open an initially empty window. The Add Effect menu allows you to choose the Audio Unit or VST plugins you want to add to the stack. When you have added a few effects, you can start previewing them by pressing the Play button, and all the effects in the stack will be applied in real time on the selected area of the document. That means that you can change the parameters of all the Audio Unit and VST plugins before committing the changes to the document. The effect stack works as a single plugin window (see section 8.1) in the way that an effect stack window is always active on the current document. The effects it contains are always applied when playing back the document. In the same way that you can save Presets for individual Audio Unit or VST plugins, you can save a whole effect stack. In addition to the Load Stack pop-up button, you can load an effect stack directly from the main Effects menu. A Load Stack menu appears below the New Effect Stack… when some saved stacks are available. TwistedWave can run in 32-bit or in 64-bit mode. When it is running in 64-bit mode, it can only load Audio Unit or VST plugins that were built for 64-bit. Reopen TwistedWave, and it will be running in 32-bit mode. The signal generator is a tool that allows you to generate simple signal patterns. The options allow you to select the shape of the wave (sine, rectangle, triangle or sawtooth), its frequency and amplitude. If you have checked the Sweep option, you will have the ability to generate chirps by selecting an end frequency. The frequency of the generated signal will change progressively from the original frequency parameter to the end frequency you have specified. When the Automatically adjust frequency to avoid clicks option is enabled, TwistedWave will make sure the end of the generated signal corresponds exactly with the end of one period. This can be useful to avoid clicks at the end of the signal. The frequency of the signal, or the end frequency in the case of a sweep, will be adjusted to make sure the wave reaches zero at the end of the generated audio. In addition to periodic signals, the signal generator can produce white or pink noise. These are two kinds of noises where the energy is distributed across all frequencies in the spectrum. When you have adjusted the signal parameters, clicking Apply will add the generated signal to the current document in one of three ways, as chosen from the Action pop-up button. Insert will insert the generated signal at the position of the cursor. Replace Selection will replace the contents of the selection with the generated signal. Mix with Selection will keep the contents of the selection, and mix it with the generated signal. 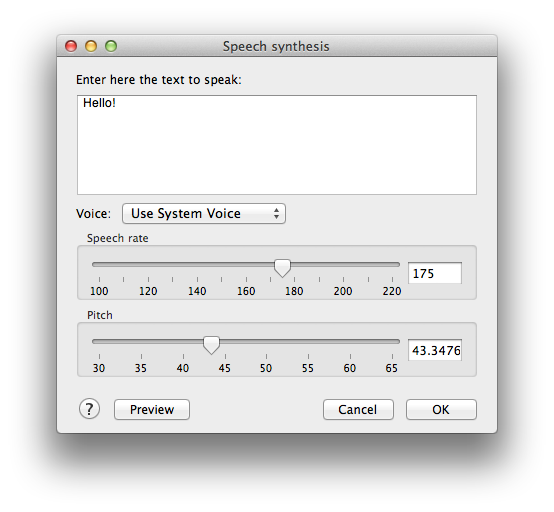 The speech synthesis effect uses Apple’s built-in speech synthesis to convert a text to speech. Enter some text, and press OK to insert the spoken text in the current document at the position of the cursor. A number of different voices are available to synthesize the speech. They can also be further refined by adjusting the speech speed and the pitch of the voice. 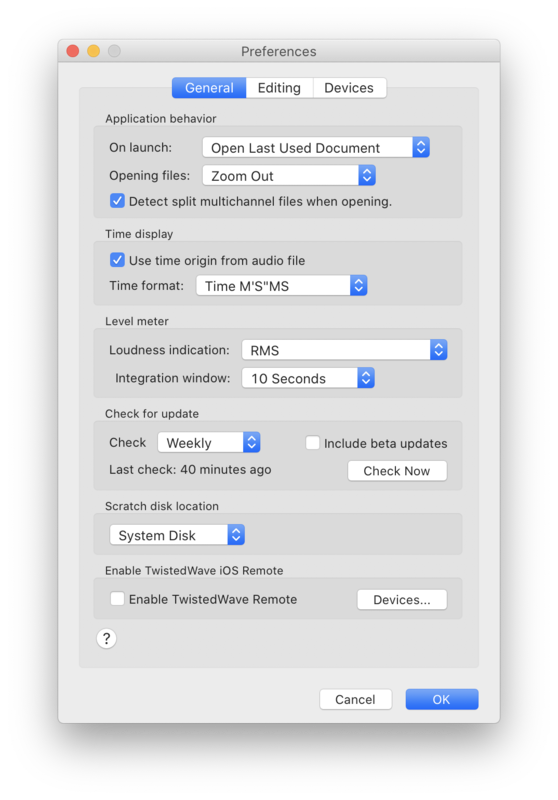 In addition to being able to import samples in many different formats, TwistedWave allows you to create new samples by recording from any of the audio devices connected to your Macintosh, such as a microphone. You can start recording by selecting Audio / Start Recording from the menu, or by pressing the Record button from the toolbar. Note that this function is available only when TwistedWave is ready, and is not currently busy reading a file, applying a filter, or performing any other background task. When the recording session has started, the audio is inserted in the current document at the position of the insertion point, and the level meters show the peak levels of the audio being recorded. This is intended to help you adjust the input level to a good value, and making sure no clipping takes place. Another recording mode is available by selecting Audio / Punch-In Recording. When that option is selected, TwistedWave will play a couple of seconds of audio before the cursor position, and when it reaches the cursor, it stops playing audio back and switches to recording. This can be very useful to re-record a section of a longer recording. 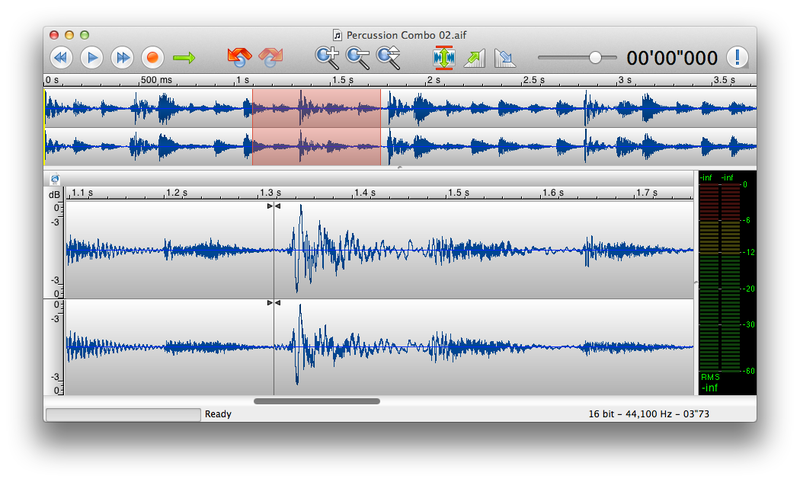 When doing a punch-in recording, by default, the recorded audio replaces the existing audio. It is possible to change that behavior, and have the new audio be inserted instead. 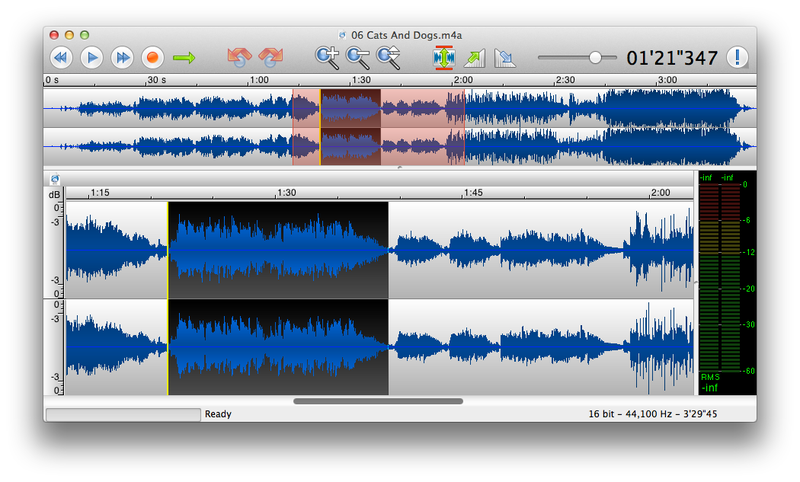 This can be configured from the preferences window, in the Recording section of the Editing tab. 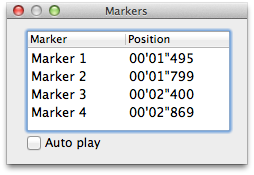 Markers are a kind of index that can be used to identify a specific place in the audio file. They can be given a name, which makes it obvious what they point to. 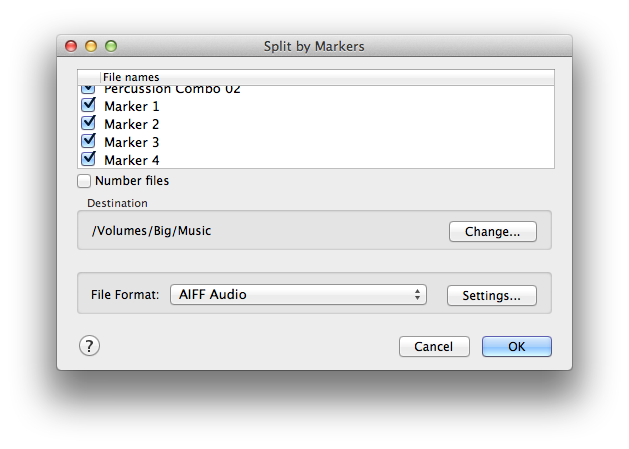 Another use for markers is to indicate the beginning of each track which might compose a sound file. When preparing a CD, the application responsible for burning the CD might expect a list of markers to indicate the beginning of each track. Add a marker by clicking anywhere in the ruler. Move a marker by dragging it within the ruler. Remove a marker by drag and dropping it out of the ruler. Manually enter its position and label by double clicking on a marker. A convenient way to create markers is to click Markers / Add Marker from the menu, or press the shortcut key M. This command will automatically add a marker at the current cursor position. Because this also works when TwistedWave is playing or recording, you can play a whole file, and mark places you want to inspect and edit at a later time. TwistedWave can also automatically add markers when certain operations are performed. See section 11.5. When an audio file is burnt to a CD, markers are often used to mark the beginning of each track. Although TwistedWave can save markers in WAV or AIFF files, some software prefer having the markers saved in a separate file. From the Markers menu, the options Import Markers… and Export Markers… allow you to manage CUE files containing markers. The CUE files are commonly recognized by CD burning applications, and contain the necessary information to split the audio file in several tracks. From the menu, the option Markers / Markers Window opens a window showing a list of all the markers present in the current document. By double clicking on the items in this list, you can easily rename the markers, and set their positions to a precise time. Because markers are often used to indicate the beginning of individual track in an audio file, an area between a pair of markers corresponds to a track, and in order to work on individual tracks, it can be useful to split the tracks, and save them in individual files. This can be done by selecting Markers / Split by Markers from the menu. By default, the names of the files generated correspond to the names of the markers, prepended by the number of the track. You can also manually edit these names, or uncheck them if you don’t want to save a specific track. 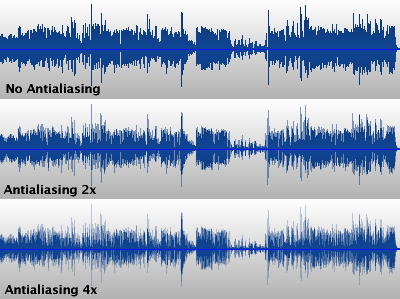 Some operations, such as cutting, or applying a crossfade can have a dramatic effect on the sound file. Therefore, it can be important to always know where such operations were applied. A convenient way to always remember a place is to insert a marker. When the option Markers / Auto Mark Cuts is enabled, TwistedWave will automatically add a marker whenever you cut a part of the file, or apply a crossfade (Delete or Delete Crossfade… from the Edit menu). Many audio file formats can store metadata in addition to the sound data itself. Metadata can consist in several pieces of information you would like to record with your document. In the case of a song for instance, you may want to record the title of the song, the name of the album and artist, and so on. You can edit this metadata with the metadata edit panel, which can be open from the menu File / Show Info…, or by clicking the Info button from the toolbar. TwistedWave can read and save music metadata from files in the aiff, wav, mp3, mp4, flac and ogg/vobis format. Note that BWAV metadata can only be saved in .wav files, and this tab will only be present when editing a file in this format. 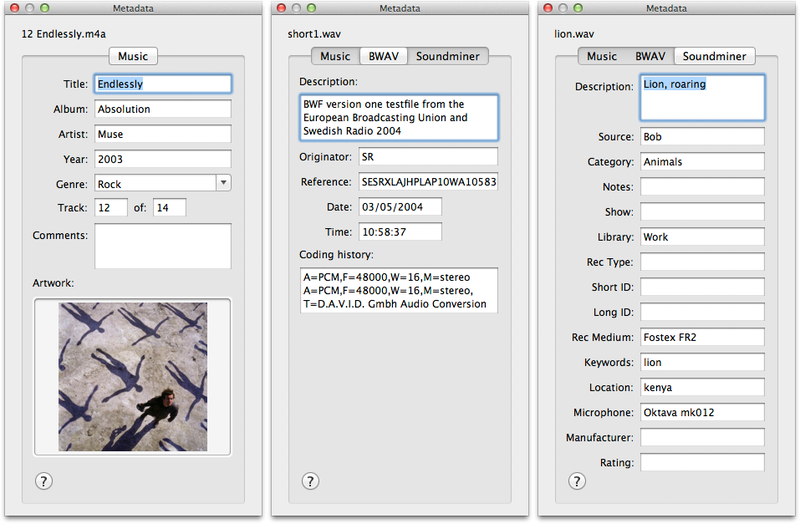 Soundminer metadata can be present in .wav and .aiff files. Although FLAC does not have native support for BWAV and Soundminer metadata, TwistedWave still allows you to edit and save FLAC files with this kind of metadata. Since version 1.2.1, the FLAC encoder has support for metadata found in the WAV and AIFF files. When used with the option --keep-foreign-metadata, the encoder will keep the metadata from the original file in the FLAC file. 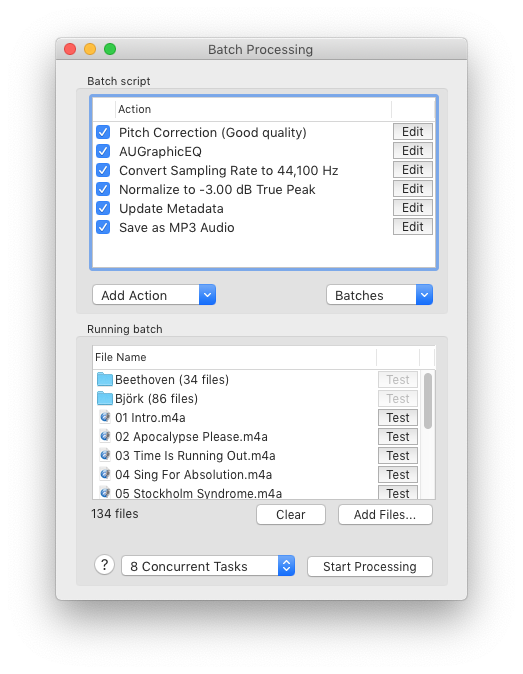 TwistedWave takes advantage of this possibility, and will save the BWAV and Soundminer metadata chunks in the FLAC files. When the FLAC files generated by TwistedWave are decoded with the command line FLAC decoder, and if the --keep-foreign-metadata option is used, the BWAV and Soundminer metadata chunks will be restored in the generated WAV file. In addition to exporting a sound file in a different audio format, TwistedWave offers the ability to export its waveform as a PNG image. 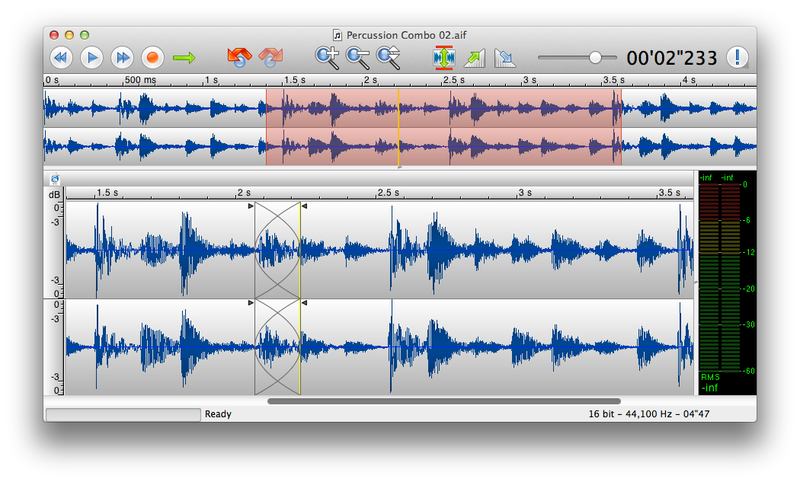 Exporting the waveform image with TwistedWave is not very different than taking a screenshot. Where this can be very useful, however, is when this is done in conjunction with the batch processing. This is a very easy way to generate a small waveform image for many files in a single step. You can read more on batch processing in section 14. The waveform export window allows you to customize the color scheme for the exported waveform, or to select an existing one from the same presets that are used to customize the appearance of the waveform in the document windows. The rendered waveform looks the same as it does in the regular editing windows, unless you add some anti aliasing. The image here shows the effect of the anti aliasing on the waveform rendering. TwistedWave’s batch processing abilities make it very easy to apply a number of effects or other transformations to a large number of files. The batch processing window, shown in the capture here, is composed of two parts. The batch script is built in the upper half, and the set of files on which to apply the script is selected in the lower half. The upper part of the batch processing window shows mainly a list of all the actions that have to be performed on the selected files. When the batch process is run, the actions are run one by one, from the top of the list to the end on each of the selected files. This list is initially empty, and a new action is added by selecting it from the Add Action pop-up button in the lower left hand corner. Most of them are the same effects that can be found in the main menu when working on individual files. In order for the batch script to do anything useful with the files, it has to do at least one of Save or Export Waveform Image. You can even have more than one Save, if you want to convert a bunch of files to different file formats at the same time, for instance. The behavior of most of the actions that can compose a batch script can be further customized by clicking the Edit button sitting next to their name. Than allows you to indicate the amount by which to change the pitch or speed of a file, for instance. In the lower right hand corner, another pop-up button allows you to save batch scripts, or load a previously saved one. In order to save the files resulting from the batch process, you have to add at least one Save action at the end of the process. 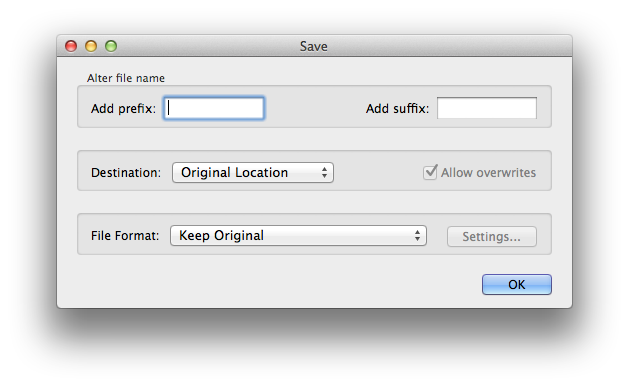 As shown in the capture, the Save action offers a number of options to select the file format, destination and name. It offers the possibility to add a prefix or a suffix in order to alter the file name. The location of the saved file, by default, is the same as the original file. It is possible, however, to select another folder. The format of the saved file can be either the original file format, or another format which you can select from the file format pop-up button. Note that if you select both the original location and format, the processed files will replace the original files, and such an action should be performed only after the batch process was tested, and verified to work as expected. If you select a different location or file format, any already existing file will only be overwritten if the Allow overwrites option was enabled. When a batch process has been defined, you can add a few files to the list by clicking the Add Files... button, or more simply by drag and dropping them directly to the list. You can add single files as well as folders to the list. When you add a folder, all the sound files it contains are looked for, and the number of file it contains is indicated in the list. Also note that when a folder has been added to the list, when a Save operation is being applied, if the destination is not the original location, the original directory tree is reconstructed in the destination folder, with the processed versions of the selected files. You can then start the batch by clicking the Start Processing button. If you want to test the batch, and run it on a single file without saving anything, you can click the Test button in front of a file name, and the processed file will open in an unsaved TwistedWave document window. The result of applying the batch script on a file will result in a processed file which will usually be saved by one or more Save operation at the end of the script. 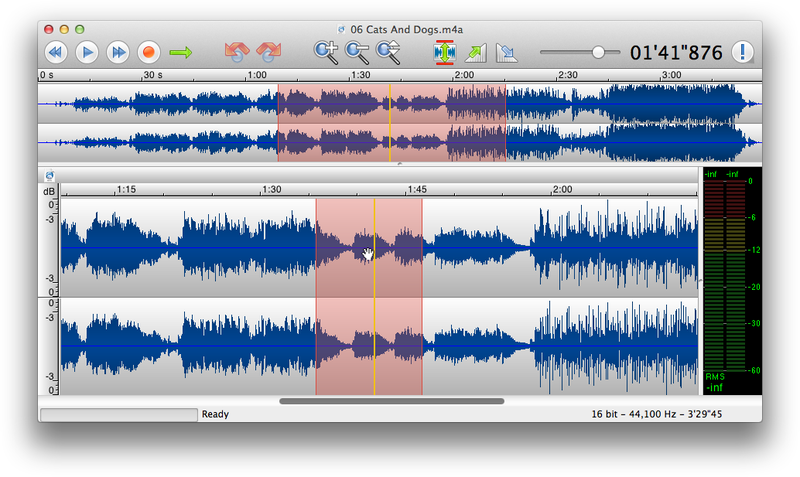 Two batch processing actions (namely Split by Markers and Split Channels) have the special ability to split an audio file into several parts. When processing a file results in more than one part, the Save operations will not save a single file, but the different parts will be saved in different files. The TwistedWave remote is an application for iPhone or iPod that can be downloaded from the App Store. It will connect to a TwistedWave application running on a mac, and allow you to remotely control it and perform a few simple tasks, such as playing, recording or placing markers. The Preferences window enables you to customize the behavior of TwistedWave. The different options available are described in the sections below. Some WAV or AIFF files can contain a time code information specifying the time reference of the file. When this information is available, TwistedWave uses it, and the timeline and cursor position displays will use it as the time origin. Even if this information is available, it may be desirable to work with times relative to the beginning of the file, which can be done by unchecking the option Use time origin from audio file. By default, the values displayed in the timelines and for the cursor position in the toolbar are in minutes, seconds, and fractions of a second. With the "Time format" option, you can also select to see the time information in sample count, or display a SMPTE time code value. Two settings allow you to customize the loudness indication visible below the level meter. By default, this value shows the RMS level in decibels. The value displayed corresponds to the energy integrated on a window whose length can be specified with the "integration window" setting. With the default of 10 seconds, the value displayed represents the loudness of the 10 previous seconds of audio. The "Loudness indication" setting allows you to select between the RMS and LUFS measurement for the loudness indications. When you select the LUFS, before integrating the energy contained in the audio, a filter is applied to the sound in order to discard the frequencies that are not perceived by the human ear, and don’t contribute to the loudness. When you register TwistedWave, either by entering a serial number, or by purchasing directly from within the application, TwistedWave becomes registered only for the user that is currently logged in on your computer. In the preferences window, an option allows you to make the registration available to all the users. When you edit a file in TwistedWave, all the audio is stored, uncompressed, in temporary files on your computer’s disk, and will remain there until you close the editor window. If you work with very large files, or need to open many files simultaneously, TwistedWave may need to use a lot of temporary storage. TwistedWave uses the system disk by default for the temporary storage. If you need more space than is available on the system disk and you have another volume connected to your computer, you can change the scratch disk location to tell TwistedWave to use the disk you want. When you have enabled the TwistedWave Remote, you can connected to your running TwistedWave instance with the iOS application, available on the app store. You can see how to use the remote in section 15. 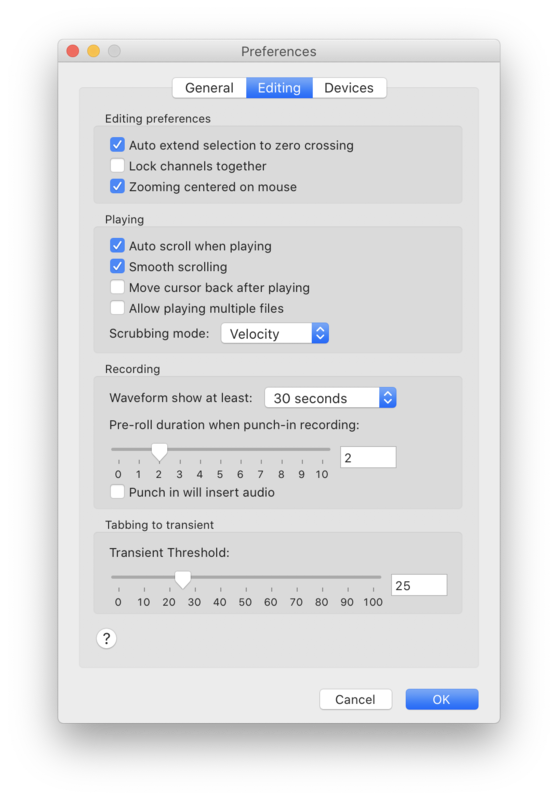 The "Auto extend to crossing" option allows you to enable or disable the ability of TwistedWave to automatically extend the selection to the next zero crossing points in the sound. This capability is described in more detail in section 4.6. The "Lock channels together" option can be very useful when working on multichannel files. When this option is checked, selecting an area will always select all the channels at the same time. By default, when zooming with the scroll wheel, TwistedWave makes sure the insertion point remains in the center of the window so that it is always visible. If you check the option "Zooming centered on mouse", zooming in and out will be centered on the mouse position instead. This allows you to control the point where you are zooming in by moving the mouse while you are zooming. This can be an efficient way to find a specific location in the waveform. The "Auto scroll when playing" option allows you to enable or disable the automatic scrolling of the waveform when playing. Disabling it can be useful when you are editing the selection, and don’t want to loose the current position just to start the playback in order to check what you have selected. When the option "Move cursor back after playing" is checked, the cursor remembers its position, and comes back to its original place after playing. The "Scrubbing mode" option allows you to select the behavior of the playhead when dragging the mouse to perform scrubbing. The different scrubbing options are described in section 6.1. The first option allows you to configure the duration of the pre-roll. This is the number of seconds of audio that are played back before TwistedWave starts recording. The second option, disabled by default, tells TwistedWave that the recorded audio should be inserted in the file instead of overwriting what is already there. 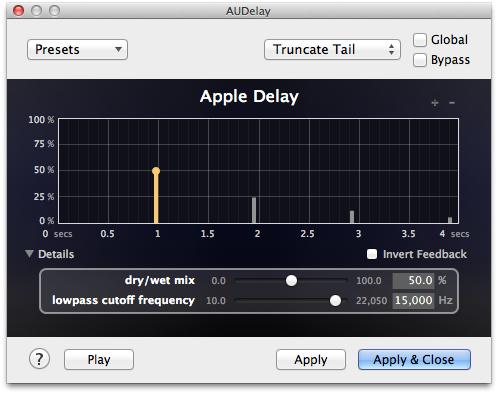 This slider allows you to adjust the threshold above which TwistedWave can detect transients. The higher the value, the more pronounced the transients have to be in order for TwistedWave to be able to detect them. The value you use may depend on the kind of document you are working on. If the transients are very marked, you can use a higher value, in order to avoid detecting unwanted transients. Using the transient detection in TwistedWave is described in more details in section 4.8. These two pop-up buttons allow you to select which input and output devices are used for recording and playback. When recording, you may want to monitor the sound being recorded. 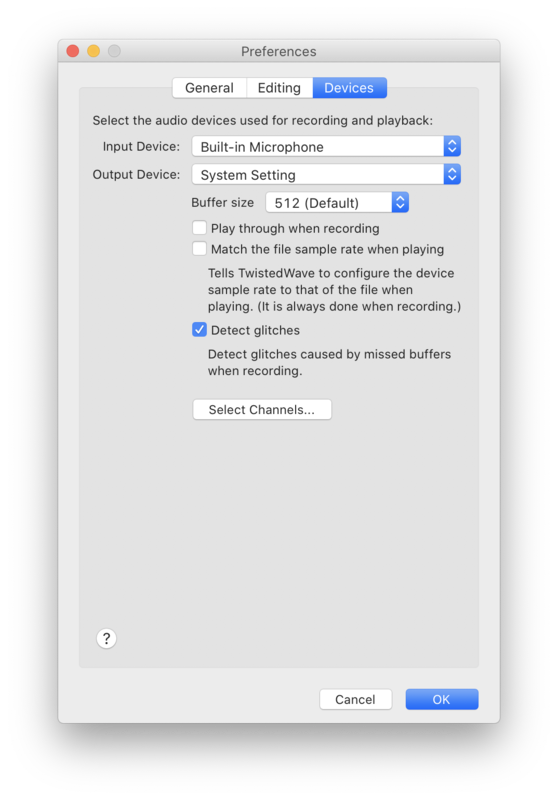 By checking the option to Play through when recording, TwistedWave will automatically play the audio fed to the input device when you start recording. A pop-up button enables you to adjust the buffer size. This instructs TwistedWave about the size of the chunks of audio that should be used when communicating with the sound card when playing or recording. This setting is useful mainly when the Play through option is used. When playing through, a small delay may be noticed between the time the audio is recorded, and when it is played back on the output device. By selecting a smaller buffer size, this delay can be reduced. When TwistedWave records from a device that has more channels than the file you are currently working on, it uses only as many channels as necessary. If you have a 16 channel input device, and record a stereo file, for instance, TwistedWave will record from the first two input channels of your input device. However, you may not always want to use the first two channels. In order to solve this, press the button "Select Channels…", and TwistedWave will open a sheet allowing you to specify the order in which the channels should be used for recording. This works exactly in the same way for playing, where you select the channels to be used for the output. 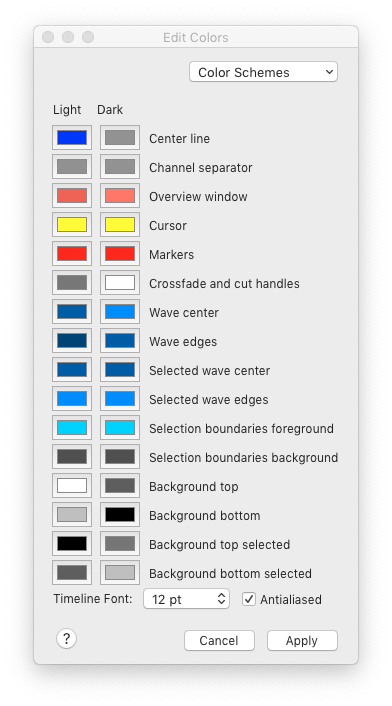 Most of the keyboard shortcuts available in TwistedWave are attached to menu items, and can be found by browsing the main menu. Additionally, some shortcuts are not attached no any menu item, and are described below. The + and - keys can be used to zoom the waveform in or out. The same effect can be achieved with the up and down arrows. The temporary zoom is activated with the Z and Shift-Z shortcuts. The process is explained in detail in section 3.4. Clicking and dragging the mouse over the waveform selects an area of the file. Shift+clicking will edit the selection by dragging the edges of the already existing selection. Option+clicking will add a region to the already existing selection. Option+Shift+clicking will remove a region from the already existing selection. When a selection is present, the left and right arrows will move the cursor to the edges of the selection. When nothing is selected, the arrows will move the cursor to the beginning or the end of the file. Pressing the space bar will start playing the audio at the position of the cursor. If a region of the file is selected, only that area is played back. Pressing space again will stop the playback. When you start working in a new environment, it takes some time getting used to it before you are able to be fully efficient. With a new application, this means getting to know how it works, what it can do for you. If you were used to a similar application, the differences between TwistedWave and what you were used to could complicate the matter. In order to leverage your knowledge of other application, it is possible to change the keyboard shortcuts to ones you are more familiar with. It is also possible to change the colors of the waveform, and make it suit your tastes better. 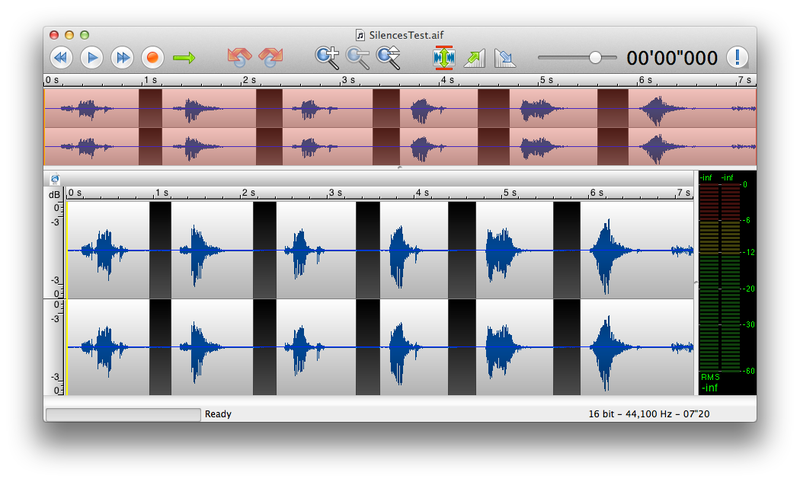 In order to change the color of the waveform, you have to open the color editor, located in Edit / Edit Colors…. This will open a window with a list of color swatches and short descriptions. You can then click to edit the colors, and see how it affects the waveform in real time. There are two columns of color swatches in the editor. The first column is used in light mode, and the second column defines the colors used in dark mode. You can configure macOS to use either the light or dark mode from the system preferences. When changing the wave color, you have the option to change both the center and edge color. Having two different colors will fill the wave with a gradient, making it look better. 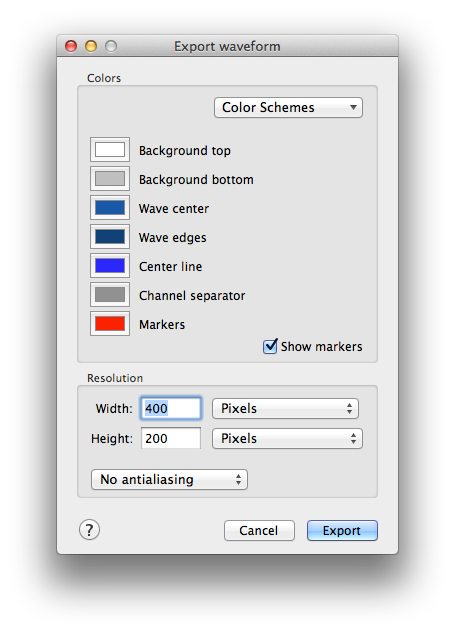 Similarly for the background color, you have to set the top and bottom color in order to define a gradient. In order to change the color of the selection, you have to specify the color of the selected wave, and the selected background. The color editing window is also the place where you can change the size of the font used in the timelines (the rulers above the main wave and overview windows). You may also like not to have the font antialiased, especially for small sizes. Similarly to the Audio Unit presets, the Color Schemes pop-up button at the top of the window allows you to save and load color schemes. The color schemes are saved in individual files, and the Manage Color Schemes… option opens a Finder window showing the folder containing all the presets you could have saved. You can remove these files, copy them on another computer or exchange them with friends. These changes will automatically be reflected in the pop-up menu. 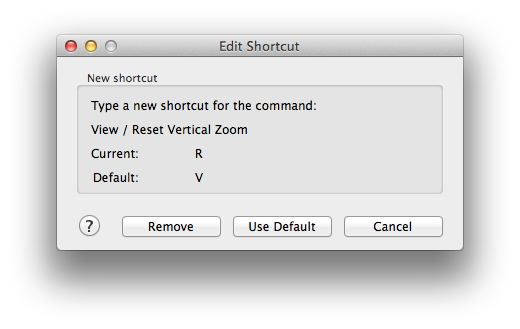 In order to change the shortcuts, select the menu Edit / Edit Keyboard Shortcuts…. The main menu will enter in shortcut edit mode, and a window will invite you to select an item from the menu in order to change its associated keyboard shortcut. When you have selected a menu item, a second window shows you the current and default associated shortcuts (if any), and waits for the next key strokes to use as a new shortcut. You are also offered the option to remove the current shortcut, or use the default. ZTX Time Stretch/Pitch Shift technology licensed from Zynaptiq GmbH, http://www.zynaptiq.com/ztx/, (c) Zynaptiq GmbH. TwistedWave uses LAME for encoding mp3 files. LAME is licensed under the LGPL (GNU Library General Public License). A copy of the LGPL can be found at gnu.org. TwistedWave uses TwoLame for encoding mp3 files. TwoLame is licensed under the LGPL (GNU Library General Public License). A copy of the LGPL can be found at gnu.org. TwistedWave uses FFMpeg for decoding files in various formats. FFMpeg is licensed under the LGPL (GNU Library General Public License). A copy of the LGPL can be found at gnu.org. Guile is licensed under the LGPL (GNU Library General Public License). A copy of the LGPL can be found at gnu.org. Id3lib is licensed under the LGPL (GNU Library General Public License). A copy of the LGPL can be found at gnu.org. Libsndfile is licensed under the LGPL (GNU Library General Public License). A copy of the LGPL can be found at gnu.org. TwistedWave uses libvorbis and libogg. They are used for reading and writing Ogg/Vorbis files. TwistedWave uses libFLAC and libFLAC++. They are used for reading and writing FLAC files. TwistedWave uses WavPack. They are used for reading and writing WavPack files.